We are part of the expanding EY legal network which includes offices in the Asia-Pacific region, Europe, the Middle East and the Americas. 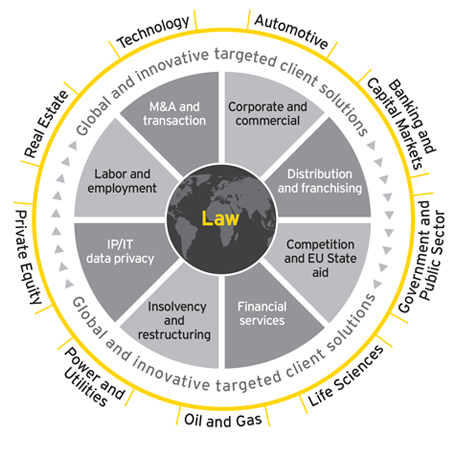 Law at EY has a truly global footprint, comprising over 1600 lawyers across nearly 80 countries. Whether acting for a client in a single legal capacity or as part of a formal multi-service EY engagement, our direct access to EY’s international network ensures clients receive an efficient, streamlined and cost effective service. Through our global reach, our team is agile and responsive — able to provide assistance whenever and wherever required. Working closely with our Assurance, Tax, Transactions and Advisory colleagues, we draw on extensive experience beyond the borders of law to provide multidisciplinary services. Our sector-focused approach ensures that we have the right level of understanding of your sector or industry so we can provide tailored advice for your business. Working with one point of contact, we provide personal, fast and efficient service because we understand what matters to you. Our Law practice is undergoing global expansion so that we can serve our clients anywhere in the world.